Eggs and larvae of Bracons are found inside the hosts' bodies. The larvae are tiny, cream-colored grubs that feed in or on other insects. Larvae molt five times and undergo 5 instars. Pupae of some species live and pupate within the host until they mature; others pupate in silken cocoons on the outside of the body of the host, while others spin silken cocoons away from the host. Adult wasps are tiny, about 2.5 mm in size, slender black or brown with threadlike waists. Female wasps lay eggs into the eggs of hosts' pests but prefer caterpillars' bodies. 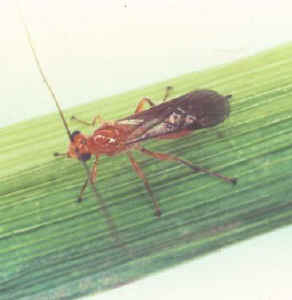 In cases where aphids are the host pests, aphids are not killed instantly. Aphids continue to feed on plants tissues until the Braconid larvae inside their bodies completely consume them. The fully-grown Braconid larvae cement the dead aphids to the leaf surface making aphids' shells black and mummified. About a week later, the adult Bracon wasps cut round holes in the mummies and emerge. The empty mummies remain on the leaf. The presence of mummies in a colony of aphids is a sign that Bracons are present. Adult Bracons feed on nectar, honeydew, or pollen before laying eggs. Dill, parsley, yarrow, zinnia, clover, alfalfa, parsley, cosmos, sunflower, and marigold are flowering crops that attract the native braconid populations and provide good habitats for them.